Direct Rail Services is giving preliminary thought to the feasibility of re-engineering its pre-Class 68 traction. Managing Director Debbie Francis explained that trends in emissions reduction might affect existing diesels, as it may be unrealistic to rely on grandfather rights continuing in the future. Even Class 66s might require modification, and while this class is currently a great performer, DRS must consider whether this will still be the case in ten or 20 years’ time. There is currently a blank sheet in terms of which locomotive type, or types, to select. For example, two diesel engines might substitute for the present one, with the number under power being determined by load factors. Work of this nature takes time to plan and execute, but can be more cost-effective than buying new traction. She said she would not rule out the relatively straightforward conversion of Class 88s to Class 68 or vice-versa, if this is what the market requires in ten years’ time. Three key factors will drive any re-engineering programme: emissions, speeds, and drivers’ comfort. Cab air-conditioning is one such factor. This marks a change from the 1970s, when drivers preferred opening windows and strong fan heaters to air-conditioning in Class 56s. 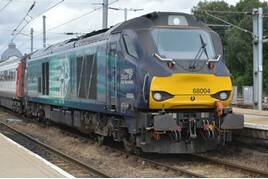 Class 88’s Bi-Mode locomotives are as eco-friendly and are identical to the Class 68’s. And I think that more Class 88’s should be built as 10 of them have been built so far. But yes Class 68’s should be re-engineered and possibly to fit battery components into the Class 68’s so that they can run on battery power aswell current diesel power.